We make the buying process as simple as it can be. Liquidate Equipment from a Single Unit to a Fleet of Equipment. Our company began as Henry Manufacturing Company, which was founded by Henry S. Branscome - an icon in the construction industry. Henry S. Branscome successfully designed, patented and sold the Concrete Cyclone Reclaimer. His success in site work, asphalt, road building, concrete, sand and gravel gave us the foundation for our outstanding reputation. We have since changed our name to Henry Equipment Sales, Inc. and have expanded into equipment sales, brokering, auctioneering, consulting and appraisals.We have worked with clients in over 50 different countries. Upon retirement, Henry S. Branscome passed the gauntlet onto Mark Hockaday. Mark Hockaday had worked with Mr. Branscome for 25 years prior to taking over the company. 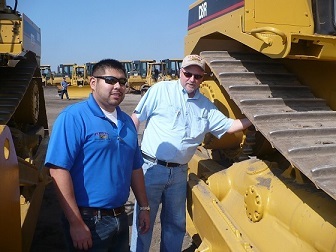 Mark Hockaday spent the next 15 years expanding Henry Equipment Sales into the company that it is today. Mark Hockaday has since stepped down from his position as President and is now our full-time Certified Senior Appraiser. As of 2016, company ownership has been passed down to Mark Hockaday's son, Justin Hockaday, who has been with the company since 2004. After serving a two-year mission for The Church of Jesus Christ of Latter Day Saints in Costa Rica, Justin was able to return to work with his father full-time. During his two-year mission, he was able to learn the Spanish language which enabled him to assist with the needs of the international market. Justin is proud to be able to continue on the family business and hopes to be able to continue the relationships that have been created, as well as establish new ones.